Adapted from Joint Oceanographic Institutions in the Classroom, 2005. Geoscientists use special boats to conduct research at sea. One of these boats is named the JOIDES Resolution (JR). Unlike most oceangoing vessels, the JR has a flat bottom, a 6.4-meter hole in the middle, 12 laboratories, and a derrick towering 67 meters above the waterline! Why? 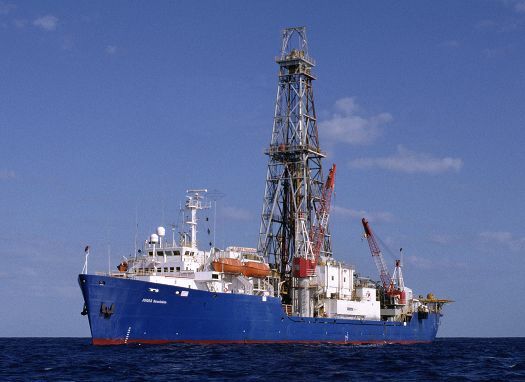 So scientists can sail nearly anywhere in the world to drill for samples of rocks and sediment from below the seafloor. What for? In hopes of discovering clues about Earth's history and structure, life in the deep biosphere, past climate change, earthquakes and natural resources. How long is the JR? 143 meters. How far below sea level can it drill? 8,382 meters. 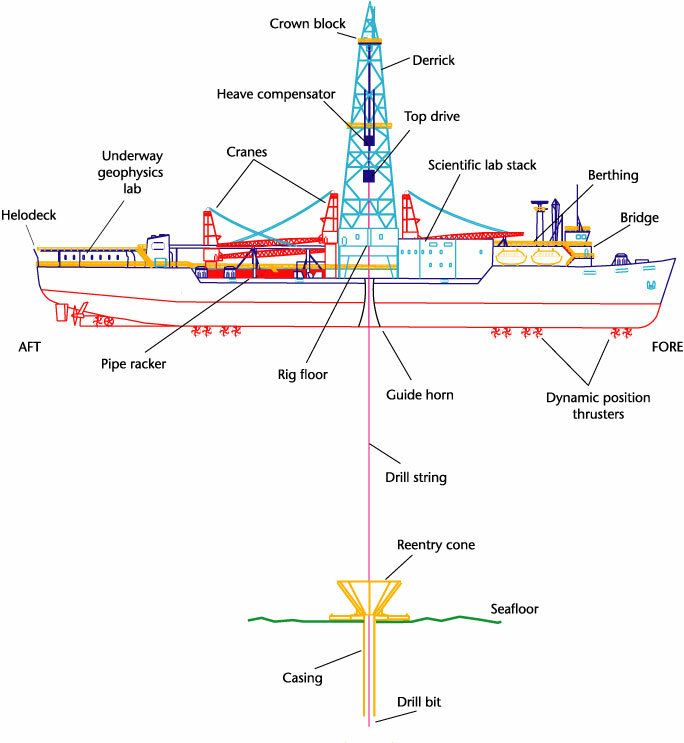 It might be helpful to construct a scale model of the ship and its drill string (the pipes that are strung from the derrick to the seafloor and below) in your classroom. In this activity, students will calculate scales of distance and length as used by ocean drilling scientists. You also can write it as a fraction, then divide to find the scale: 143 m/152 cm = 0.94 meters per centimeter. The length of the ship to the length of your classroom. The height of the ship, 67 meters, to the 152-cm measuring tape. The height of the ship to the height of your classroom. The shallowest water depth to date, 38 meters, to the measuring tape. The shallowest water depth to the height of your classroom. The greatest water depth to date, 5,980 meters, to the measuring tape. The greatest water depth to the height of your classroom. The deepest hole sampled, 2,111 meters, to the measuring tape. The deepest hole to the height of your classroom. The greatest water depth plus the 560-meter hole in the seafloor below it, to the height of your classroom. To learn more about the JR, read about Expedition 301 at http://www.ldeo.columbia.edu/BRG/RESEARCH_PROJECTS/IODP/301.html. Create a scale model of the JR with the drill string extended. Convert all the metric measurements above to English measurements.